A beautiful symbol of the life you'll share, this infinity ring features enough pink sapphire glimmer to complement a lifetime together. This lovely ring is more than a gesture of good faith. It's a shared moment, a gift, a promise. 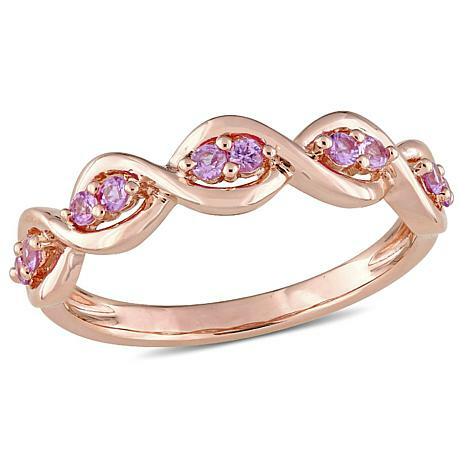 THIS BEAUTIFUL RING IS JUST SO VERY PRETTY. LOVE, LOVE, LOVE THE PINK SAPPHIRE. IT IS SMALL AND DAINTY, BUT THE SAPPHIRES ARE VERY VISIBLE. GREAT FOR MY SMALL SIZE 5 RING FINGER. DAINTY, BUT MIGHTY!